The Chinese GM, Wei Yi, need have no more worries about worldy fame. His name has already gone into history: the Chinese player has just played his immortal game at 16. This happened recently at Danzhou, in a traditional tournament, in which Ding Liren, Yu Yangyi, Wei Yi, Wang Yue, Ni Hua, Bu Xiangzhi, Lu Shanglei and Wang Chen are playing, plus Lazaro Bruzon Batista of Cuba and India's Krishnan Sasikiran. It was against Bruzon in round two that Wei Yi showed a distinct lack of hospitality. 21.Nd5! The introduction to a masterpiece. Up to now, almost everything was theory. One can consider the new move 19...Re8?! dubious, but in this case, it is not so important. 21...Nxd5? It takes two to make a masterpiece in practice, and Black shows he is ready to help. 21...Bxd5 gives saving chances. 22.Rxf7!! A deflecting rook sacrifice. 22...Kxf7 23.Qh7+ Ke6 (23...Kf6 24.exd5 e4 25.Rf1+ Ke5 26.Qxg6 Kxd5 27.Qxe4#) 24.exd5+ Kxd5 If 24...Bxd5 a mistake would be 25.Qxg6+? Bf6, and White has no more than a draw: 26.Bf5+ Ke7 27.Bg5 Bxg5 28.Qg7+ (28.Qxg5+? Kf8) 28...Bf7 29.Qxg5+ Kf8 30.Qh6+ Ke7 31.Qg5+. Correct therefore is 25.Bxg6!, and after 25...Bxg2+ (there is nothing else) 26.Kxg2 d5 27.Qf7+ Kd6 28.Qxe8+ White keeps an extra bishop and a winning position. 25.Be4+!! A crushing blow. One cannot but remember the great Paul Morphy, who first demonstrated that time can be more important than material in chess. 25...Kxe4 26.Qf7 It is important not to let the king retreat to d5. One could give this quiet queen move (not the only one in the game) an exclamation mark, but it should be noted that 26.c4! leads to a forced mate in nine. 27...Kd4 Trying to avoid the draw loses quicker: 27...Kf5 28.Rf1+, and mate in four. 31.Qd3! Only move. It was still possible to miss the win: 31.c4? (opening the queen's line to d1) 31...Bxg2+! 32.Kxg2 Qa8+ 33.Kg1 Qe4!, and Black draws in all variations. Admittedly, as well as the simple - 34.Rxf6 Kh4 35.Bd2 Qg4+ 36.Kh1 Qe4+ etc - there is also the more complicated: 34.Qd1+ Kh4 35.Qe1+ Kh5 36.h3! g5! 37.Rxf6 Rh8! Amazing moves, but all the independent play in this game is the same. 31...Bxg2+ It is easy to see that other moves also lose - the white pieces coordinate too well for the lone black king. 36.Be1!! And the Chinese finds it. He spoils things with 36.Qd3+? Kg4 37.Qg3+ Kf5 38.Qh3+ Kf6 39.Qxd7 Bf4 - White regains his material but loses his advantage. Black resigns because mate is unavoidable. eg, 36...Bh4 37.Qd3+ Kg4 38.Qxg6+ Bg5 39.h3+ Kxh3 40.Qf5#. Or 36...Rf8 37.Rxf8 Bh4 38.Qd3+ Kg4 39.Qxg6+ Bg5 40.h3+ Kxh3 41.Qe6#. Lately Wei Yi has been compared with Magnus Carlsen, more often than anyone else. The Eastern wunderkind became a GM slightly later than the Norwegian - at 13 years, 8 months and 23 days (four whole months older than Magnus! ), but his rating has grown faster than the current world champion's. This is shown in the graph. Interestingly, this amazing win against Bruzon is Wei Yi's only one so far in the tournament. 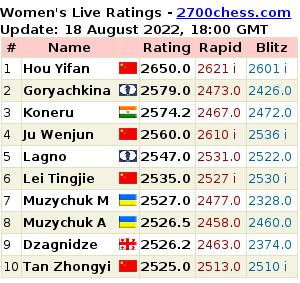 Three rounds before the end, the star has only 3 points and is in 6th place, with Wang Yue leading. After the day-off, Magnus Carlsen has finally managed to win a game in Norway Chess 2015. The one who fell prey to him in round 5 was Alexander Grischuk. As Alexey Shirov forecast yesterday, on the second day of the Riga match, we saw a different Anatoly Karpov. But we also saw a different Evgeny Sveshnikov. Both these changes resulted in the match score becoming 2.5-1.5 in favour of the former world champion. It is hard to veterans to fight in time-trouble and Sveshnikov failed to cope with the clock in game three. Today in Danzhou, the sixth annual tournament ended, featuring several top players, two young hopefuls and two well-known foreign guests from Cuba and India, in a round robin event. The tournament will mainly be remembered for one particular game, which has been hailed as the "game of the century". Admittedly, the winner Wei Yi, who produced a whole series of !! moves, won only one other game in the event and finished fourth. The first half of the 50th Capablanca Memorial is over in Havana. 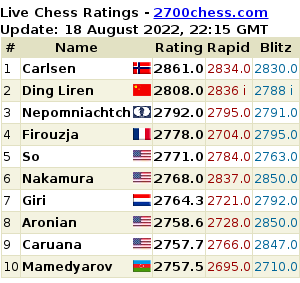 The ratings of six GMs taking part in the double round-robin are similar to each other (the only exception is Bruzon who is below 2700), yet one of them, Yu Yangyi, mopped up the first cycle with amazing 4.5/5. The second game of the match in Prague proved no less tense than the first, but today, David Navara did not manage to save a slightly inferior position. To continue fighting in the final of the FIDE World Cup, Sergey Karjakin needed only a win as Black in the third match game against Peter Svidler. First he managed to prevent Svidler from drying out the position and then achieved his goal. However, it was anything but an easy battle - Karjakin's fans had quite some occasions to clutch at their chests. In Wenzhou, the third game in the match between the top Chinese player Ding Liren and Boris Gelfand ended. Round 10 of the super GM tournament is still under way in Biel. Wang Hao not just finished his game earlier than others, but he achieved the main aim - gained a three points by beating one of his main rivals. The leader of 50th Capablanca Memorial, Yu Yangyi, has passed through a tough segment of the tournament distance: in rounds 5-7, he had three Blacks. After his lucky win against Ian Nepomniachtchi, there was a day-off followed by the defeat against Dmitry Andreikin. Last night, the rivalry for first place could have got even more tense: the Chinese was gradually outplayed by Pavel Eljanov and blundered badly in a difficult position.